SAN JOSE, CA--(Marketwired - Jun 17, 2015) - Propelics, a leader in enterprise mobile strategy and delivering world class mobile apps, today announced the launch of SureAudit. This is the first and only complete app that enables organizations to accurately and efficiently perform audits throughout the enterprise. SureAudit is a versatile, secure app that enables organizations to evaluate literally anything -- employees, customers, safety regulations, behaviors, stores and much more providing total flexibility. Organizations are then able to configure reports however they would like -- within or across districts or regions, over time or per manager or employee. SureAudit is a fast, intuitive, database-driven auditing tool for enterprises across all industries. Its multi-hierarchical structure easily accommodates unlimited users, employees and environments and gives organizations complete control over the functionality, content, and character of audits. Traditionally this process is manual -- an auditor enters notes from various sources into a computer, or faxes the report to the corporate office where someone enters the information into a computer. As a result, these readings are often inaccurate and time consuming. 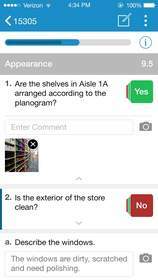 With SureAudit, an auditor is able to simply tap to answer questions, attach pictures and add comments. The easy-to-use app provides an intuitive guide along the way to ensure completeness. The result is efficient auditing with 100% accuracy. The web-based reporting dashboard provides access to key insights for audits. "Propelics' SureAudit is a game changer for auditing," said Adam Bookman, co-founder and partner of Propelics. "With this app, organizations can now efficiently and accurately capture audit results while saving time and money." SureAudit is a managed service that includes app upgrades, testing for new devices and OS releases, future feature implementations and additional integrations. Backed by the industry leading mobile support team, Propelics provides 24×7 support. Click here to request a demo. Propelics is a leading provider of Enterprise Mobile Strategy Services, Mobile Advisory Services, and Mobile Application Services to some of the world's largest brands. Headquartered in San Jose, the company has over 60 years of combined leadership experience working with customers to enable their mobile strategy. For more information, visit www.propelics.com or connect with us on Facebook, Twitter, Google+, LinkedIn and Vimeo.